Indian Creek is a beautiful place to hang out, even if the weather's a bit unsettled and your arms are weak. In Utah, you can ride a motorcycle without a helmet, but you can’t buy beer stronger than 3.2%. It’s a familiar yet exotic place; both culturally and geographically. The locals are incredibly friendly, while their religious beliefs and customs are simply incredible. For someone coming from damp coastal climes, the desert itself possesses a certain exotic beauty that hopefully even my inept photography will convey. 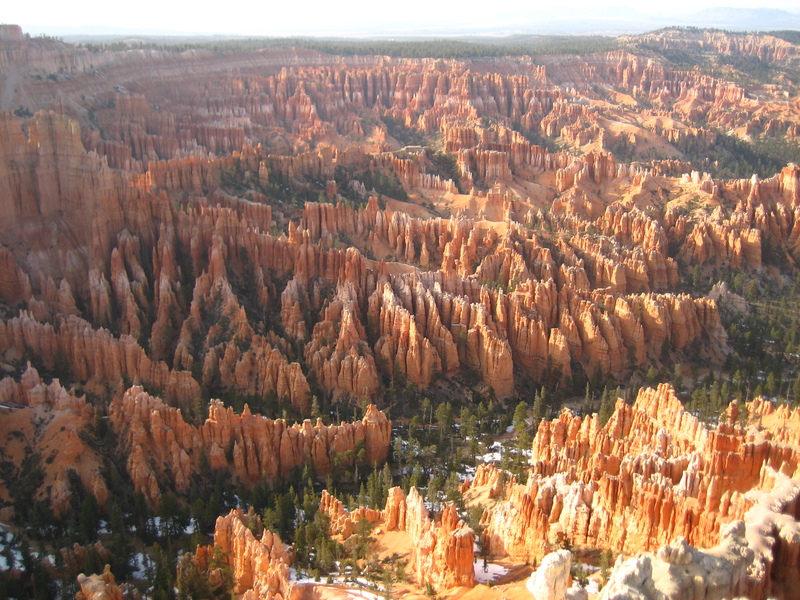 Bryce Canyon. No climbing here, but pretty cool nonetheless. 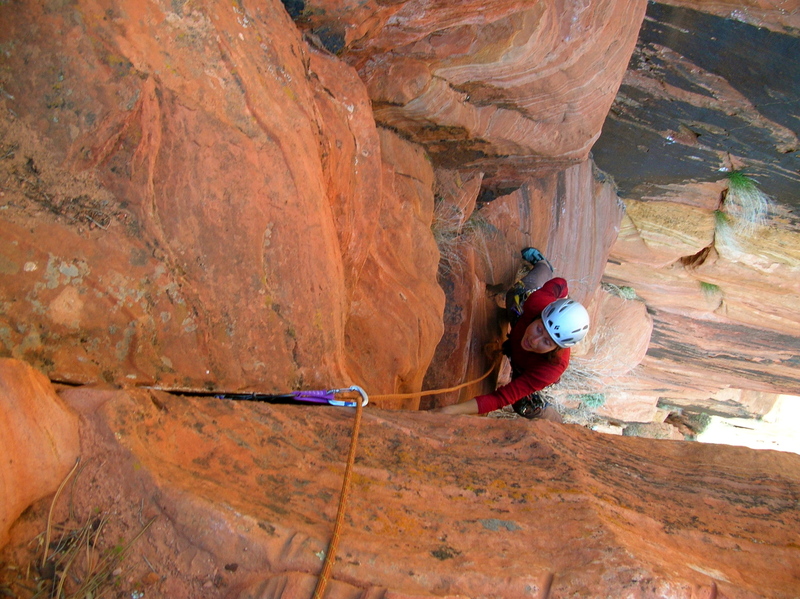 Karina climbing one of the beautiful sport routes in Kolob Canyon. After a rigourously scientific survey, I determined that the average family size on the Zion tourist shuttle bus is seven. 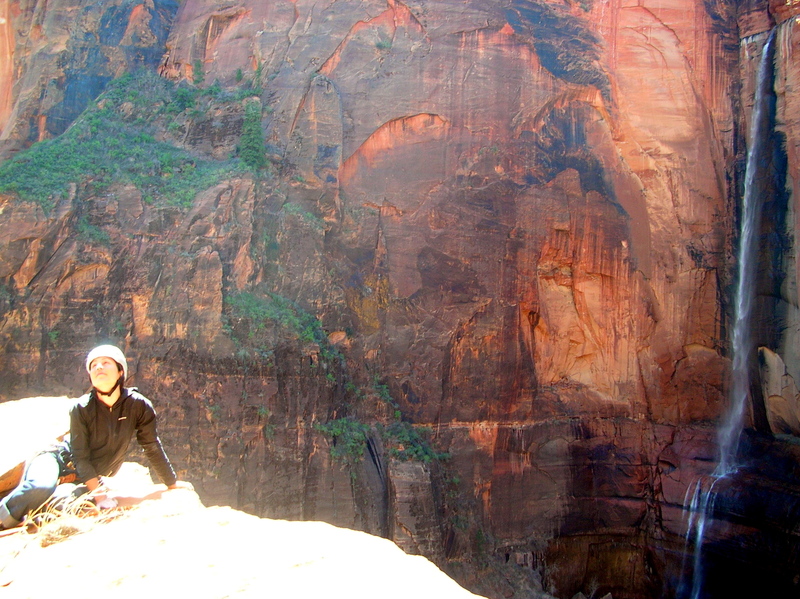 In a similar study, I determined that approximately nine out of ten hikers on the Angel’s Landing Trail will stop you to ask if you “climbed up the face” should you be so foolish as to hike down with any climbing gear visible on your person. Compare this to approximately one in ten on the backside trail on the Chief, and you’ve got another piece of data supporting my long held belief that Americans are far more obnoxious than Canadians. Sadly, the recent Canadian federal election suggests that my belief is only 60% correct. Karina on the top of the unfortunately named Toilet Crack in the Temple of Sinewava, Zion. 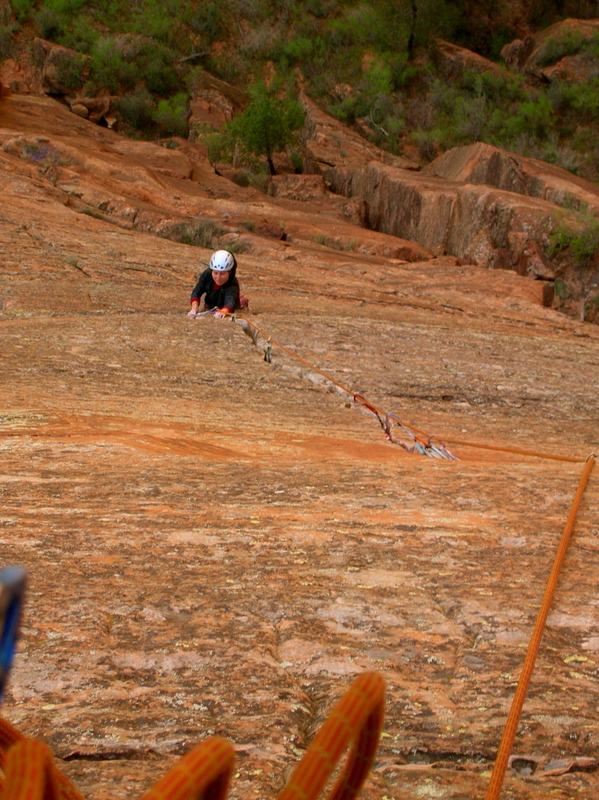 Karina on the phenomenal crux pitch of Shune's Buttress. 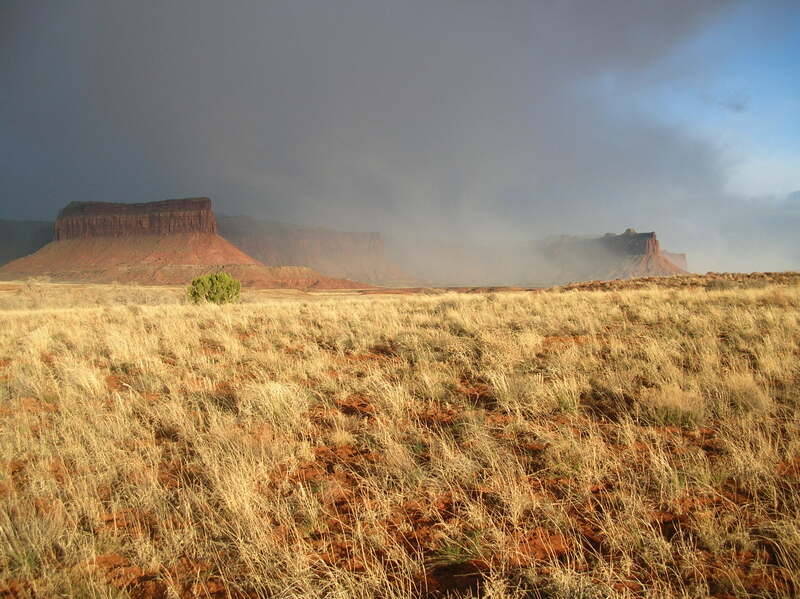 During the week that we spent in Zion, we seldom hiked more than five minutes from the road (the exception, oddly enough, was to go sport climbing in Kolob Canyon) and all the routes that we climbed were well-known classics. Nonetheless, we experienced no shortage of adventure. 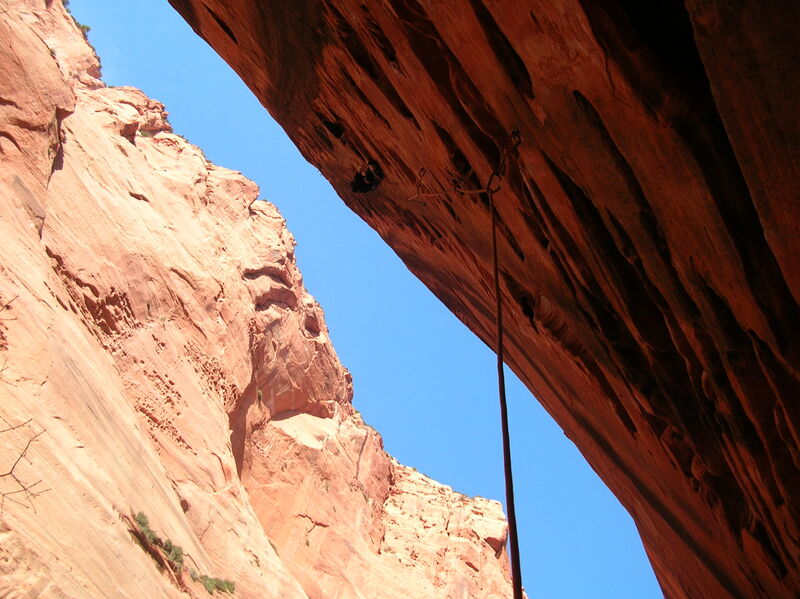 We climbed lots of wide cracks, we got sand in our eyes, and we rappelled off countless scary anchors consisting of spinning bolts or half-protruding drilled angles (why doesn’t anyone do something about these?). Karina leading the second pitch of Ashtar Command. 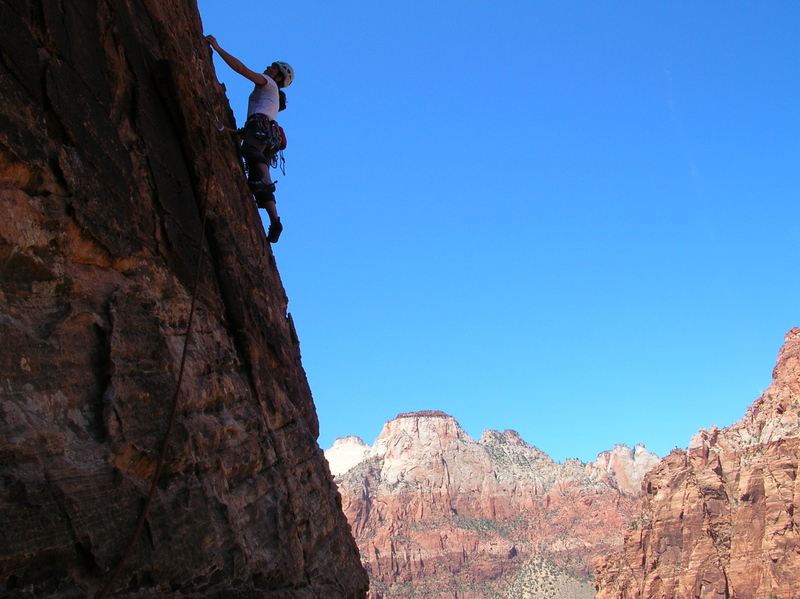 Perhaps because I’m just not a very talented rock climber, I tend to value adventure more than pure technical difficulty, so it’s not surprising that Zion is one of my favorite climbing areas. Karina, on the other hand, is definitely more talented and as a result prefers thought-provoking technicality to groveling up sandy offwidths. Still, thanks to her stoicism we enjoyed some memorable days climbing high on the canyon’s sandstone walls, looking down (both figuratively and literally) on the cultural peculiarities of the bustling throngs below. Karina following the last pitch of Monkeyfinger. I think that her eyes are closed because they're full of sand. While the first six pitches of Monkeyfinger follow beautifully varnished cracks, the last couple pitches are rather more adventurous.